So what is additive metal technology? Additive Metal Technology is new and emerging, and once understood and embraced by industry provides significant product feature advantages in terms of reduced mass, thermal management, metallurgical integrity and a reduction in manufacturing process steps. Also, in certain conditions lower fabrication costs and improved quality as well as reduced time to market for prototypes. 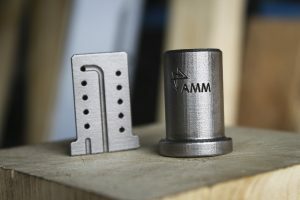 The Additive Metal Technology also known as 3D metal printing produces complex metal components from a fine metal powder and offers a wide range of metallic materials from stainless steel to aluminum alloys. Specialty machines using computer controlled high speed lasers are at the heart of this technology with computer aided design interfaces that allow the product designer to be liberated from the constraints of existing and conventional subtractive technology. This creates a disruptive yet productive influence on how future products may be designed and produced.